Islamabad: The US has long suspected that much of the billions of dollars it has sent Pakistan to battle militants has been diverted to the domestic economy and other causes, such as fighting India. Now the scope and longevity of the misuse is becoming clear: Between 2002 and 2008, while Al Qaida regrouped, only $500 million of the $6.6 billion in American aid actually made it to the Pakistani military, two army generals tell AP. At the time of the siphoning, Pervez Musharraf, a Washington ally, served as both chief of staff and president, making it easier to divert money intended for the military to bolster his sagging image at home through economic subsidies. “The army itself got very little," said retired genreal Mahmud Durrani, who was Pakistan’s ambassador to the US under Musharraf. “It went to things like subsidies, which is why everything looked hunky-dory. The military was financing the war on terror out of its own budget." Generals and ministers say the diversion of the money hurt the military in very real ways. Helicopters critical to the battle in border regions were not available. At one point in 2007, at least 200 soldiers were trapped by insurgents in the tribal regions without a helicopter lift to rescue them. The limited night vision equipment given to the army was taken away every three months for inventory and returned three weeks later. Equipment was broken, and training was lacking. It was not until 2007 that money was given to the Frontier Corps, the front-line force, for training. The details on misuse of US aid come as Washington again promises Pakistan money. Legislation to triple general aid to Pakistan cleared Congress last week. The legislation also authorizes “such sums as are necessary" for military assistance to Pakistan, upon several conditions. The conditions include certification that Pakistan is cooperating in stopping the proliferation of nuclear weapons, that Pakistan is making a sustained commitment to combating terrorist groups and that Pakistan security forces are not subverting the country’s political or judicial processes. The US is also insisting on more accountability for reimbursing money spent. For example, Pakistan is still waiting for $1.7 billion for which it has billed the US under a Coalition Support Fund to reimburse allies for money spent on the war on terror. But the US still can’t follow what happens to the money it doles out. “We don’t have a mechanism for tracking the money after we have given it to them," Pentagon spokesman Mark Wright said over telephone. Musharraf’s spokesman, retired general Rashid Quereshi, flatly denied that his former boss had shortchanged the army. He did not address the specific charges. “He has answered these questions. He has answered all the questions," the spokesman said. Musharraf took power in a bloodless coup in 1999 and resigned in August 2008. The misuse of funding helps to explain how Al Qaida, dismantled in Afghanistan in 2001, was able to regroup, grow and take on the weak Pakistani army. Even today, the army complains of inadequate equipment to battle Taliban entrenched in tribal regions. For its part, Washington did not ask many questions of a leader, Musharraf, whom it considered an ally, according to a US Government Accountability Office report released last year. Pakistan has received more money from the fund than any other nation. It is also the least expensive war front. The amount the US spends per soldier per month is just $928, compared with $76,870 in Afghanistan and $85,640 in Iraq. Yet by 2008, the US had provided Pakistan with $8.6 billion in military money, and at least $12 billion in all. “The army was sending in the bills," said one general who asked not to be identified because it is against military rules to speak publicly. “The army was taking from its coffers to pay for the war effort—the access roads construction, the fuel, everything... This is the reality—the army got peanuts." Some of the money from the US even went to buying weapons from the US better suited to fighting India than in the border regions of Afghanistan—armor-piercing tow missiles, sophisticated surveillance equipment, air-to-air missiles, maritime patrol aircraft, anti-ship missiles and F-16 fighter aircraft. “Pakistan insisted and America agreed. 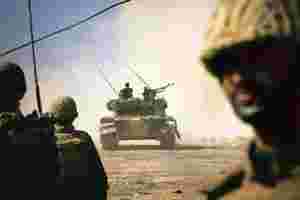 Pakistan said we also have a threat from other sources," Durrani said, referring to India, “and we have to strengthen our overall capacity. “The money was used to buy and support capability against India." The army also suffered from mismanagement, Durrani said. As an example, he cited Pakistani attempts to buy badly needed attack helicopters. Pakistan asked for Cobra helicopters because it knows how to maintain them, he said. But the helicopters were old, and to make them battle-ready, the Pentagon sent them to a company that had no experience with Cobras and took two years, he said. As a result, in 2007, Pakistan had only one working helicopter—a debilitating handicap in the battle against insurgents who hide, train and attack from the hulking mountains that run like a seam along the Afghan-Pakistani border. The army was also frustrated about not getting more money. Military spokesman general Athar Abbas said the US gave nothing to offset the cost of Pakistan’s dead and wounded in the war on terror. He estimated 1,800 Pakistani soldiers had been killed since 2003 and 4,800 more wounded, most of them seriously. The hospital and rehabilitation costs for the wounded have come to at least $25 million, Abbas said. Pakistan’s military also gives land to the widows of the dead, educates their children and provides healthcare. “These costs do not appear anywhere," he said. “There is no US compensation for the casualties, assistance with aid to the grieving families." Even while money was being siphoned off for other purposes on Pakistan’s end, the US imposed little control over or even had specific knowledge of what went where, according to reports by the US Government Accountability Office. The reports covered 2002 through 2008. The reports found that the Pentagon often ignored its own oversight rules, didn’t get adequate documents and doled out money without asking for an explanation.